On August 24th, the Newark City Subway bid farewell to its fleet of PCC cars, which had provided service for 47 years. By Monday August 27th, modern LRVs had replaced these venerable performers, which were placed in storage. 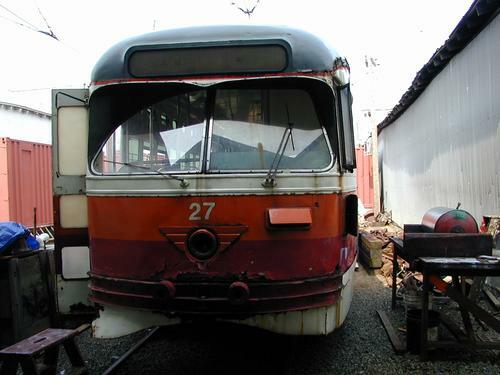 On September 20th, Newark PCC car #27 rolled off the special low-slung trailer of Silk Road Transport and onto the railhead of the museum's historic line. Within a few hours, master mechanic Ted Eickmann took an inspection trip down the line with the car to listen for any flat spots on the wheels. The wheels checked out fine. Lest the reader be confused, it would be helpful at this point to clarify a few matters. First, said inspection trip was made by being towed with car 629. Car 27 was not in operating condition when it arrived. Moreover, this Newark PCC did not come from Newark, at least not directly, and therein lies a tale that spans the decades. The first Electric Railway Presidents' Conference Committee (PCC) production model car was, of course, the museum's 1001, delivered to Brooklyn & Queens Transit in 1936. By the end of World War II, thousands of cars had been manufactured in the United States. Twin Cities Rapid Transit, which operated routes in the Minneapolis/St. Paul area, was a late-comer to the PCC game. In 1945, they snagged one car which would have been Pittsburgh #1547. It ran as TCRT #299. Evidently pleased with the performance of the PCC car, TCRT took delivery of 140 additional cars between 1946 and 1949. All were made by St. Louis Car Company. As delivered, the cars were set up for two-man operation, with a conductor's station in the center of the car. By 1951, these were removed, increasing seating capacity from 53 to 55. 91 went to Mexico City. Another 20 went to Shaker Heights. This operation, owned by the city of Shaker Heights, which is a suburb of Cleveland, provided commuter service between those two locales. Although Shaker had purchased 25 PCC cars new in 1948, the bulk of their equipment was second-hand. Finally, 30 Twin Cities cars landed in Newark. The Newark City subway first opened on May 26th 1935 as a confluence of several trolley lines into downtown Newark. The line was extended to Penn Station in 1937 and Franklin Avenue in 1940. Penn Station and the Broad, Washington and Warren Street stations are located below ground. Emerging from the portal, the line runs along the abandoned bed of the Morris canal, which first opened in 1831. The total length of the line with its 11 stations is just over 4 miles. Originally, 4 subway-surface routes were operated: #21-Main Street, #23-Central Avenue, #29-Bloomfield Avenue and #7-City Subway. The #43/Jersey City, #13/Broad and #27/Mt. Prospect lines also ran briefly in the new subway between 1937 and 1938. 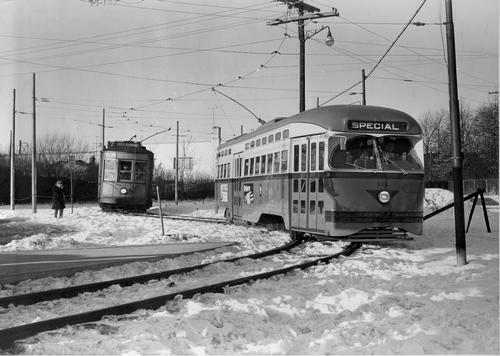 As the subway was being built, Public Service Coordinated Transport, the operator of this and many other trolley lines in the area, was cutting back many of its lines. Shortly after the subway opened, it with its 4 routes became the lone trolley operation in Newark, all others being converted to bus. Therefore, no new cars were purchased and service was made with obsolete steel-wood hybrid cars which dated from the teens. Double-ended cars were used exclusively on the 7/City Subway route as there was no loop at the end of the line at Franklin Avenue. By 1952, only route 7 remained. Rather than convert this line too, PSCT decided to modernize it and acquire the 30 second-hand cars from Twin Cities, standardizing on the General Electric equipment. The cars arrived in 1953. Because they were single-ended (as is typical for PCC cars), it was necessary to construct a loop at the Franklin Avenue station. This was done and the 30 PCC cars took over in January 1954. For decades, these cars provided frequent, fast and reliable service. The PCC cars were painted grey and white with blue trim. Over the course of time, 8, 18, 29 and 30 were scrapped. In 1976, the cars were painted in the red, white and blue bicentennial scheme. To its 25 year career in the Newark City Subway, the Shaker Heights episode is a brief footnote in the history of car 27. The car was used regularly in service until 1982, and then was held for several years in reserve. By this time, RTA's fleet of LRVs manufactured by Breda was operating, albeit with problems, and the PCCs were called upon only under special circumstances such as heavy snow. There, in Shaker Heights, car 27 ended its service life. This diversion to Ohio was in many ways fortunate from a museum standpoint. Shaker did not heavily modify the car and therefore it came to be preserved as a time capsule of the Newark City Subway as of the 1970s. Still present on car 27 are the ceiling-mounted speakers that were part of a brief and ill-fated attempt to pipe in music and advertisements in Minneapolis. In 1980, the Newark operation became part of New Jersey Transit. The 24 remaining PCCs received heavy overhaul between 1983 and 1985 during which many body, mechanical and electrical items were changed. The new LRVs, manufactured by Kinki Sharyo, are double-ended. In conjunction with their deployment, the line was extended about a mile, including 2 new stops and a new maintenance facility, and the loop which was installed in 1954 to accommodate the PCCs was removed. Although retirement of the PCCs in Newark had been announced as imminent several years ago, delays in converting the substation, overhead and signal systems for the new LRVs pushed the transition back several times. By the time late August 2001 came around, the PCC cars were mechanically very tired, although still sound performers with considerable residual value. As a result, New Jersey Transit is holding on to all of the cars and will most likely sell them to other transit operations or possibly use them on a potential heritage trolley operation somewhere in New Jersey. None of the cars is slated to go to existing museums at this time. However, cars 3 and 27, which had been at Shaker Heights, eventually found their way during the early 1990s to the Minnesota Transportation Museum, which operates the Como-Harriet historic streetcar line in Minneapolis. MTM completed a beautiful restoration of car 3 back to Twin Cities #322. Car 27 was carefully stored pending a decision as to its fate. Earlier this year, MTM decided not to pursue a second restoration and declared 27 to be surplus, making it available to us in exchange for items from our spare parts inventory which will help MTM complete other restorations. Although car 27 will require body and electrical work, the car is mechanically sound and complete, and will need very little back-dating to restore it to classic Newark City Subway appearance and function. 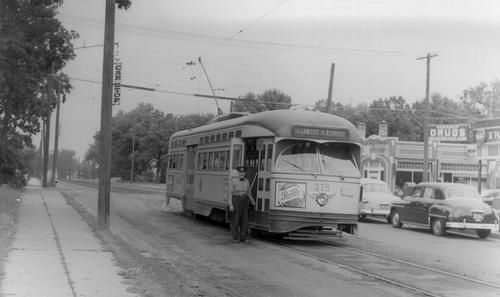 The primary modifications done by Shaker Heights were the replacement of the window glazing with lexan, repainting, and the addition of a tripper mechanism (Shaker cars share trackage in Cleveland with rapid transit trains and must be equipped with wayside signal trippers similar to those used in the NYC subway system). Here are the roster data for car 27: Built in 1949 by St. Louis Car Company, order #1670. 46'5" long, 9'0" wide, approximately 38,000 lbs. Seats 55. General Electric 17KM12N2 control with four 1220E1 motors. Brakes are Clark external-contracting drums with G.E. MK16 electric actuators. Rides on a pair of Clark B-2 trucks. With the addition of car 27 we now have a matching bookend for 1001, completing the PCC story from early air car to modern all-electric. Thanks to George Isaacs, Jim Vaitkunas and the gang at MTM for their help, and to the members of our museum who have supported this acquisition through their donations.